Click "Add State" for each state you select. 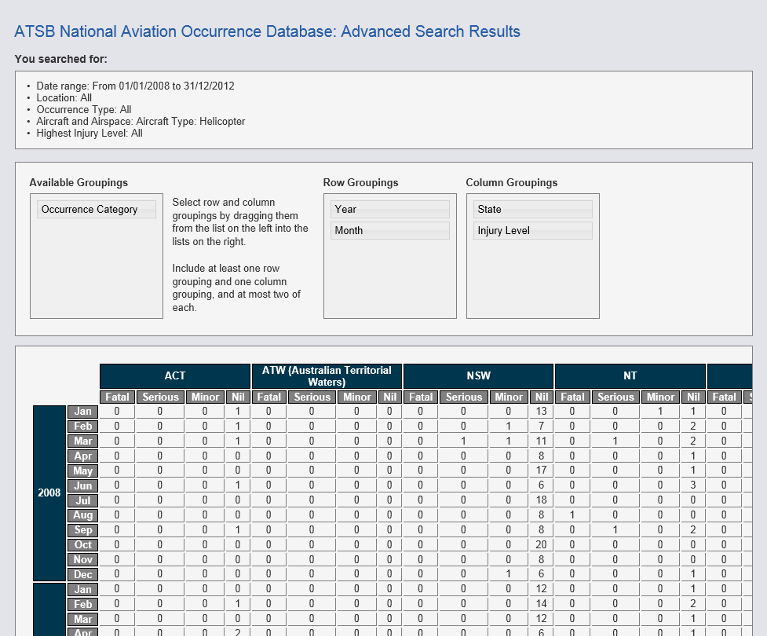 You may filter the list of airports by first selecting a state. Begin typing a name in the Airport field to see matching airports. Click "Add Airport" for each airport you select. You may filter the list of locations by first selecting a state. Begin typing a name in the Location field to see matching locations. Click "Add Location" for each location you select. Click "Add Type" for each Common Occurrence Type you select. 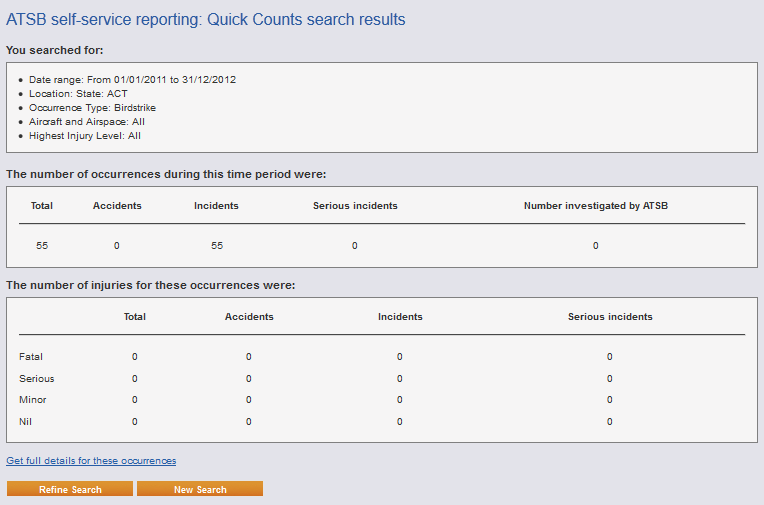 Click "Add Type" for each Occurrence Type you select. Selecting "Add Operation Type" and "Add Manufacturer" will only add Operation and Manufacturer fields. You must select the "Add" button for the filters to be applied. All other fields are multi-select. 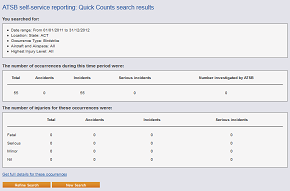 There are three search and reporting options available: Quick Counts and the more detailed Cross-Tabulation and Detailed Data. When you click on either Cross-Tabulation or Detailed Data from the Quick Counts Results screen, your selected filter options and search results are carried across, where you can then refine your search. e.g. 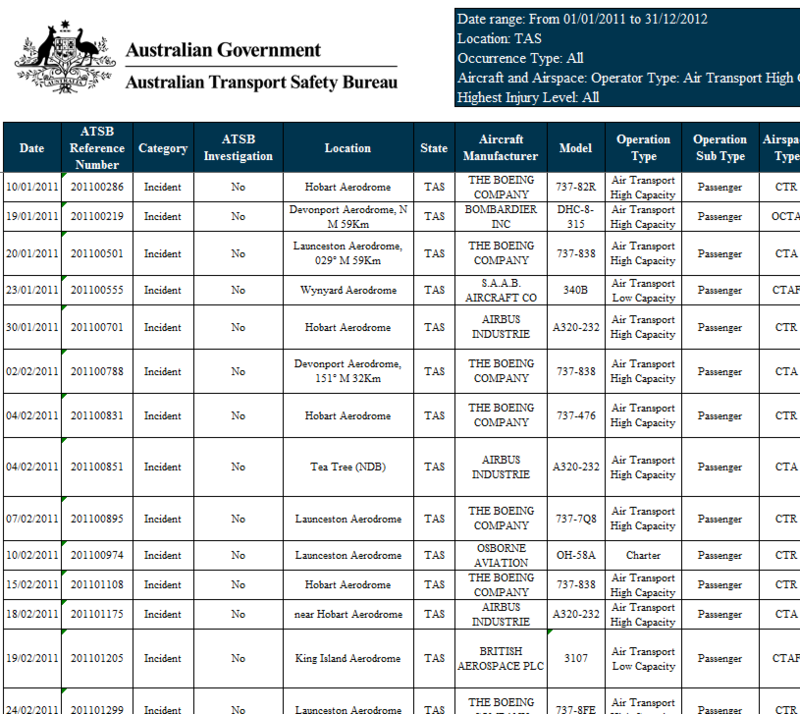 How many birdstrike incidents occurred in the ACT in the last two years. Cross-Tabulation lets you add more detailed filter options and cross tabulate the search results, giving you more control on what data is retrieved and how it is displayed. Use this option if you require a table of data that contains up to four different seach criteria. Detailed Data lets you add more detailed filter options and view full details for a particular set of criteria. e.g. 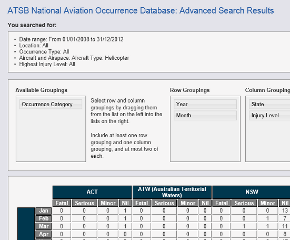 Occurrences for all commercial passenger flights in Tasmania in 2011  2012. To view the detailed search results, just click on either the "Export to Excel (.xlsx)" or "Export to .csv" button. 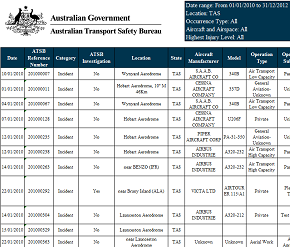 When using these statistics, it is important to remember that occurrence data is provided to the ATSB by responsible persons as defined in Part 2.5 of the Regulations. The ATSB accepts no liability for any loss or damage suffered by any person or corporation resulting from the use of these statistics.